In most cases when two teams from the same division play each other, especially early, the score is close because the two clubs know each other so well. I don’t think that will be the case when the Buffalo Bills host the New York Jets Sunday afternoon at New Era Field. With the Bills, there is a new coaching staff with new schemes on both sides of the ball. So the Jets won’t have much to go on as far as tendencies. Sure they can look at Carolina tape from the last few years and get an idea of what the Bills will be doing defensively. But the Buffalo personnel on defense isn’t close to the same personnel Carolina has had, especially at linebacker. The preseason isn’t much of a help because clubs generally play very vanilla-type offenses and defenses. On offense, the Bills offensive coordinator is Rick Dennison, who has been at Denver the last two seasons. In 2015 he had a guy named Peyton Manning playing quarterback. Last year it was a combination of Trevor Siemian and Paxton Lynch. Right now with Tyrod Taylor at the positon, he is dissimilar to any of the quarterbacks Dennison had in Denver. So will the Bills try and run the same type of game plan? I doubt it. So from the aspect of game planning, the Jets are almost going into this game blind. The Jets schematically will be doing basically the same as they have the last two years on defense, albeit with different personnel that we have seen the last two seasons. On offense, the Jets coordinator is John Morton, who came from New Orleans where he had a guy by the name of Drew Brees playing the quarterback position. With Josh McCown holding down the QB position for New York, the Bills can’t expect the Jets to be running anywhere close to the same offense the Saints have. This is also Morton’s first year as an offensive coordinator so there is no history of what he likes to do. 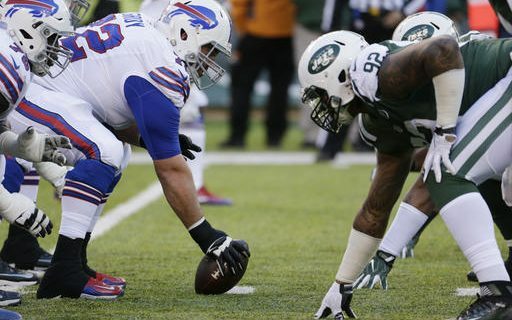 The Jets offensive line is very inexperienced on the right side. On the left there is experience, but this is the first time that Kevin Beachum and James Carpenter have played together. There are two new starters at the wide receiver position and one (Jermaine Kearse) has only been with the Jets for a few days after coming over in a trade with Seattle. The most experienced and productive player on the Jets offense is running back Matt Forte. At one time was one of the better all-around running backs in football. But now he’s coming off one of his least productive seasons and at 31, he has already has played nine years in the NFL. That’s a lot for a running back. The Jets defense is another story as their front three in the base 3-4 is very talented but not deep after the starters. Ends Leonard Williams and Muhammad Wilkerson are as good as there is in the NFL. The outside linebacker position is athletic but inexperienced. Inside the combination of Derron Lee and Demario Davis is athletic and instinctive. The two starting safeties are the top two picks of the Jets in the last Draft. Both Jamal Adams and Marcus Maye leave college with strong resumes. While they could, and should, make some rookie mistakes, there is no doubt the duo is very talented. The two corners, Buster Skrine and Morris Claiborne are not that strong. Looking at this game from the outside, I feel that on paper the Bills should win this game by at least 10 points. While the Bills roster is not exactly what Sean McDermott and Brandon Beane want at every position, they have more talent than the Jets and the added plus of playing at home give them a distinct advantage.